On July 30th, Twitter announced that it was releasing a feature to recommend friends to follow right on the sidebar of the site when you log into Twitter.com. It was only a matter of time before their Who to Follow algorithm turned up someone who had passed away. 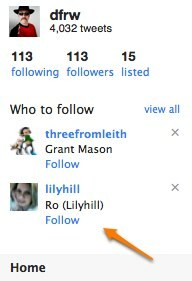 My friend Dean Whitbread, @dfrw, alerted me this morning that upon logging in and seeing this feature for the very first time, he was disturbed to see his friend Ro, @lilyhill, recommended as someone to follow. She had died unexpectedly of a stroke in May 2009. Two days later, Ro’s daughter used her mom’s cell phone to text a last message to the account to notify @lilyhill’s friends of her passing. This same problem has been on Facebook since they rolled out their Suggested Friends feature in March 2008. And automated friend recommendations without the context of whether the person is alive or dead is the source of one of the most frequent complaints that I hear about Facebook. However, in Facebook, users have the ability to report a user deceased and memorialize their account. A memorialized account removes some personal information, prevents new friend requests and still allows existing friends to post messages to the deceased’s Wall. It also removes the user’s account from the “Suggested Friends” algorithm so that your dearly departed does not appear there. Twitter has no such ability to deal with the deceased’s account. In fact, Twitter has no policy regarding the death of a user at all. The closest they have is an inactive accounts policy which states “Accounts may be removed from the site due to prolonged inactivity,” which they consider to be six-months. The policy then goes on to say they’re working on a way to release these accounts in bulk, but that they have no time line for when this might happen. The account of the first person I knew on Twitter to pass away, @mochant, in December of 2007, is still there, well past the six-months to be considered an inactive account on Twitter. Speaking to Dean Whitbread this morning about his friend @lilyhill, he remarked “we felt like family.” After her death in May 2009, he wrote blog post about Ro as a way to acknowledge his grief and pay tribute to his friend whom he’d known online for 18- months. A comment on that post left by @Otir, another of Ro’s online friends, talked about how she was grieving online. “I am still feeling bereaved, probably because unlike if we were close blood family, I haven’t been actually able to pay my respects and attend her funeral or say goodbye in a proper way, I guess writing a tribute for a friend we met online is the proper way to do it. Sadly, online social networks using algorithms to build connections between users fail to take into consideration the real human emotion of what that means to people when those connections are lost. Update #1: I was reminded that LinkedIn also has this practice of recommending people who have passed away.